takes the bride and groom through an illustrated, step-by-step process that includes everything they need to know about the day leading up to the ceremony and all other pre-wedding events they need to plan. Every challenge a couple might face is dissected and solved using practical solutions based on Sonal’s expertise. Sonal J. Shah founded her company in 2004 and has built connections with the finest hotels and catering halls in the country. RP Report said that Sonal’s name is synonymous with “high quality, platinum weddings, especially in the South Asian community.” She is based in New York City and has been featured in Crain’s New York Business, USA Today, The Wall Street Journal, The Washington Post and The New York Times as well as on television on the Style Network’s Whose Wedding Is It Anyway? and Married Away. How Does This Book Differ From the Competition? 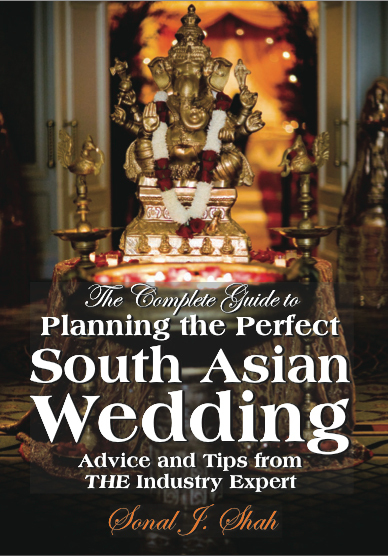 Most wedding planning books that teach South Asian wedding traditions fail to infuse the luxury or modern touches for which Sonal’s platinum weddings are famous. This book acknowledges that American-born South Asians are hip, style conscious and looking for weddings that embrace their own personal tastes. This book addresses that mode of thinking while also respecting the sacred traditions of the South Asian union.